Amphitrite is an often overlooked goddess of the Ancient Greek pantheon, but in antiquity, Amphitrite was revered, for she was both the wife of Poseidon, and the Greek goddess of the Sea. Amphitrite is normally referred to as a Nereids, one of the 50 nymph daughters of the Greek sea god Nereus, and his wife, the Oceanid Doris. This indeed, is the parentage of Amphitrite given by Hesiod (Theogony). Occasionally though, it was said that Amphitrite was not a Nereid, but an Oceanid, with the goddess’ parents named as Oceanus and Tethys, making Amphitrite a sister of Doris, rather than a daughter. Nereids and Oceanids were both minor water goddesses, with the 50 Nereids linked to the saltwater of the Mediterranean Sea, whilst the 3000 Oceanids were the nymphs of the freshwater sources of the Ancient World. Nereids and Oceanids were beautiful nymphs, and Amphitrite was amongst the most beautiful of all the water nymphs of Greek mythology. The importance of Amphitrite would increase greatly when a new generation of deities took control of the cosmos; the time when Zeus and his siblings rose up against the earlier rule of the Titans. After victory in the Titanomachy, rule of the cosmos was divided between the three brothers, Zeus, Hades and Poseidon. Zeus would be given the heavens and earth, Hades the underworld, and Poseidon the world’s waters. Poseidon, whilst having a palace upon Mount Olympus, would also have one beneath the waves of the Mediterranean, and amongst his retinue were the 50 Nereids. Time came for the three brothers to choose immortal consorts, and Zeus would eventually have Hera as an eternal bride, Hades would abduct and then wed Persephone, and Poseidon would set his eyes firmly upon the Nereid Amphitrite. Now the attentions of a powerful god proved unwanted though, and Amphitrite fled from the advances of Poseidon. Amphitrite decided to flee to the furthest extremes of the sea, or at least the Mediterranean Sea, and so the Nereid hid herself away near the Atlas Mountains at the furthest point east of the Mediterranean. The disappearance of Amphitrite only caused Poseidon to become more infatuated with the Nereid, and so the new ruler of the seas sent out aquatic creatures to find the hidden Amphitrite. One such tracker of Amphitrite was the sea god Delphin (Delphinus) who came across Amphitrite as he swan between the islands. Delphin didn’t forcibly take Amphitrite back to Poseidon, but through his eloquent words, Delphin convinced the Nereid of the positive elements of marrying Delphin, and so Amphitrite returned to the palace of Poseidon. Some tell of Delphin undertaking the marriage service, but in any case, Poseidon was so thankful for the work of Delphin that the likeness of the dolphin shaped god was placed amongst the stars. Upon marriage to Poseidon, Amphitrite would be proclaimed as the Greek goddess of the Sea, although this meant goddess of the Mediterranean. Amphitrite would bear Poseidon several children, including Triton, a sea god who acted as the messenger for his father, Rhode, the goddess nymph of Rhodes, Bentheseicyme, the Greek goddess of waves, and Cymopoleia, the goddess of storm waves and wife of the Hecatonchire Briareos. It was also occasionally said that Amphitrite was the mother of sea life such as fish, shellfish, dolphins and seals, although the parentage of such marine life is more commonly given to other sea goddesses, especially Tethys. 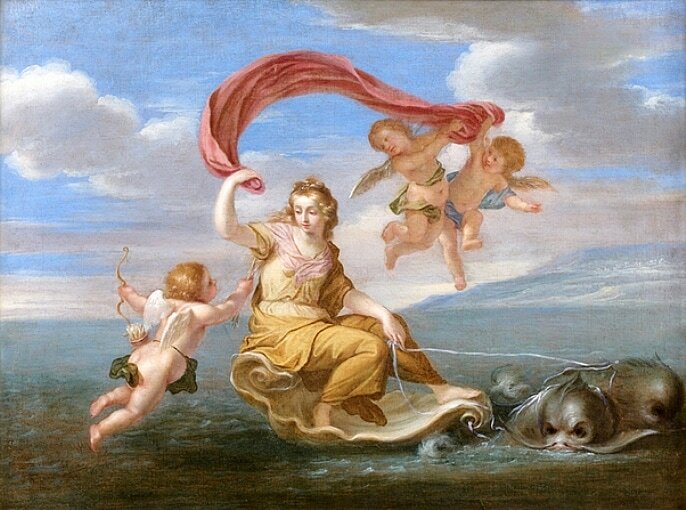 Aside from her marriage to Poseidon, Amphitrite appears infrequently in other mythological tales, and she was primarily depicted as being a companion of Poseidon upon his sea chariot. It was occasionally said that it was a jealous Amphitrite who transformed Scylla into a monster, although where a transformation of Scylla occurred, the metamorphoses was normally blamed upon Circe. Amphitrite does briefly appear in some tales of Theseus, when Minos doubted the divine parentage of Theseus, Amphitrite was said to have presented her husband’s son with a crown. Additionally, in the tale of the Argonauts, Amphitrite sent one of the horses who pulled Poseidon’s chariot, to help move the Argo.